Once relegated to the wooden shelves of healthy food shops with decisively unappealing packaging and even worse advertisements, natural beauty is being reborn. At the forefront are companies like Clean Beauty Co. that create 100% natural products, vegan, cruelty-free, beautiful packaging and super fair pricing. They have recently launched BYBI beauty with two products: Prime Time and Babe Balm - let me give you the (literally) juicy details below. p.s. shot these right out of the box so they would be untouched but waited a couple weeks before writing this so I'd actually be able to test them out! Prime Time is hands down the most amazing face scrub I have ever tried. It's main ingredients are marshmallow root and apple & pineapple acids that help polish and prepare your skin to better absorb nutrients from your moisturiser (in my case it being coconut oil). It gently scrubs away all the dead skin cells and leaves your skin bright and ready to apply makeup smoothly. On that note, can we just admit that the right skin care routine is going to make the biggest difference in how your makeup is going to look and stay throughout the day? 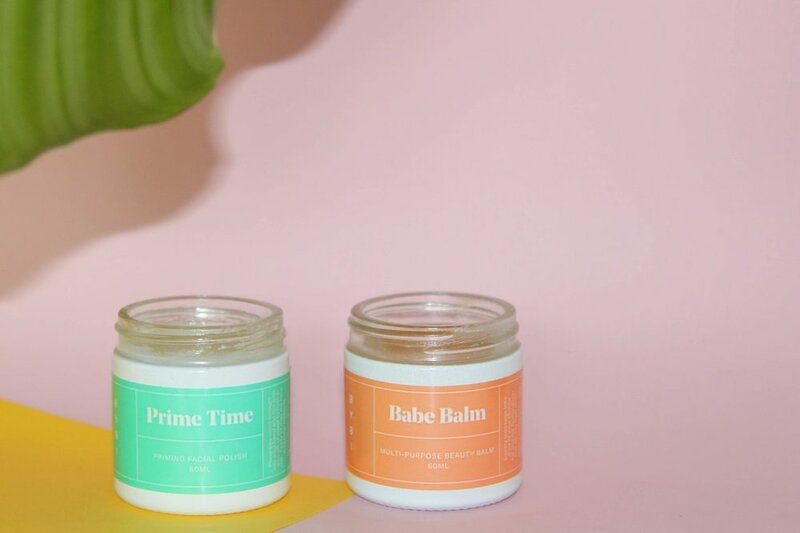 Babe Balm is a multi-purpose balm (I'm sold already), which you can use as highlighter, moisturiser, lip balm and anything else you can think of. I use mine on lips and cheeks to give them some glow and my new favourite thing to do, since I don't wear a lot of makeup is spread a little on my eyelids, then apply mascara. It really makes your eyes pop and just look sparkly. I used to do this trick with lipgloss but to be honest it just gets way to sticky and heavy so I stopped and now use this balm instead which is super light, you forget it's there and it stays shiny the whole day. It's main ingredients are Coenzyme Q10 (which is an antioxidant), kokum butter (which has insane healing properties), Monoi (made from soaking the petals of Tahitian gardenias in coconut oil - in short: newest addiction), Squalene (another antioxidant with magical properties) Hibiscus and Calendula. Doesn't hurt either that it smells like a peach smoothie consumed in the shade of a palm tree sitting on the beach. One thing I will say for these two products is that you seriously run the risk of eating them because they smell insanely good! I wonder if you can?